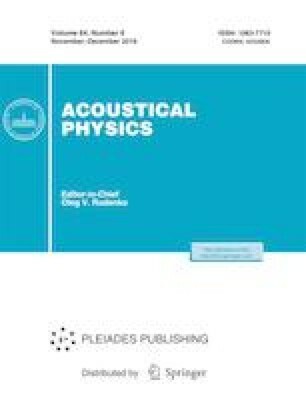 A theory of acousto-optic filtering is developed based on Bragg diffraction of a plane light wave in the near field of radiation from an acoustic transducer excited by an electric signal with a discrete frequency spectrum. Approximate solutions to the problem have been considered for various degrees of overlap of neighboring discrete passbands of a multiband acousto-optic filter (MAOF) and for various diffraction efficiencies. Particular cases have shown good agreement between the developed analytical method and numerical calculation for the dynamic transmission function of the MAOF under study. It has been noted that insufficient time resolution leads to detection of an averaged transmission function, which could considerably differ from instantaneous samplings of a dynamic transmission pattern. This study was supported by the Russian Foundation for Basic Research, project no. 16-02-00124-a.